The Lincoln Memorial: Like many of our classic memorials to presidents, this one includes excerpts from Lincoln's speeches--including the full text of the very short Gettysburg Address. 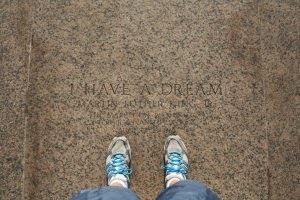 But putting your feet on the spot where Martin Luther King, Jr. gave his "I Have a Dream" speech is the ultimate destination. Look at the space on the plaza and around the pool and imagine the audience of 250,000 people that day--so many, they were sitting in the trees on either side. 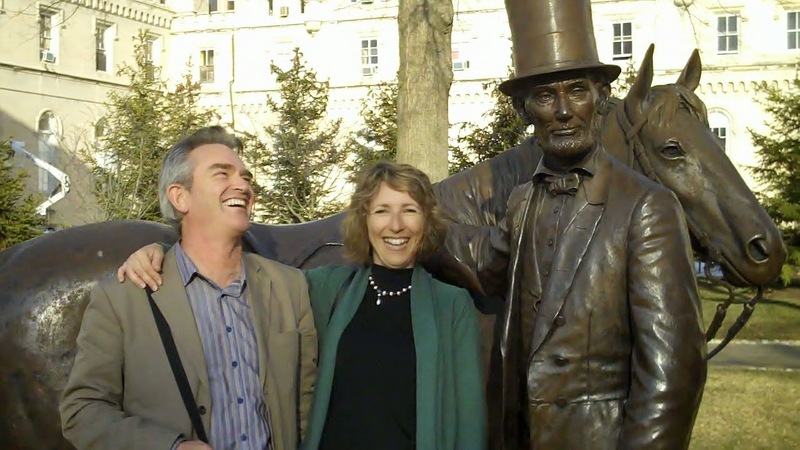 Here's Peter Botting, at right, in front of the Gettysburg Address at the memorial. The Washington Monument: Our first president, George Washington, gets the tallest monument. You can go all the way to the top for the best aerial view of the city, and don't forget to turn around and view the Lincoln Memorial from here, whether you're at the base or the top. The King Memorial: One of the only memorials in town to honor a non-president, it's loaded with quotes from his speeches, so take your time here. In the spring, it's surrounded by cherry trees and their famous blossoms. The Jefferson Memorial: This memorial also is adorned with the words of this president and author of our Declaration of Independence. 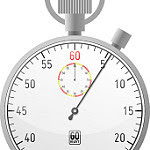 I like to remind speechwriters of President John F. Kennedy's great line when welcoming the Nobel laureates from the Western hemisphere to the White House: "I think this is the most extraordinary collection of talent, of human knowledge, that has ever been gathered together at the White House, with the possible exception of when Thomas Jefferson dined alone." The FDR Memorial: This may be my favorite memorial, with outdoor "rooms" for each of his four terms in office, and quotes from his speeches on the walls. There's also a tribute to Eleanor Roosevelt, herself a frequent speaker as she could travel more easily than her husband; here, the nod is to her work after his death, leading the international diplomatic effort that led to the Declaration of Human Rights. 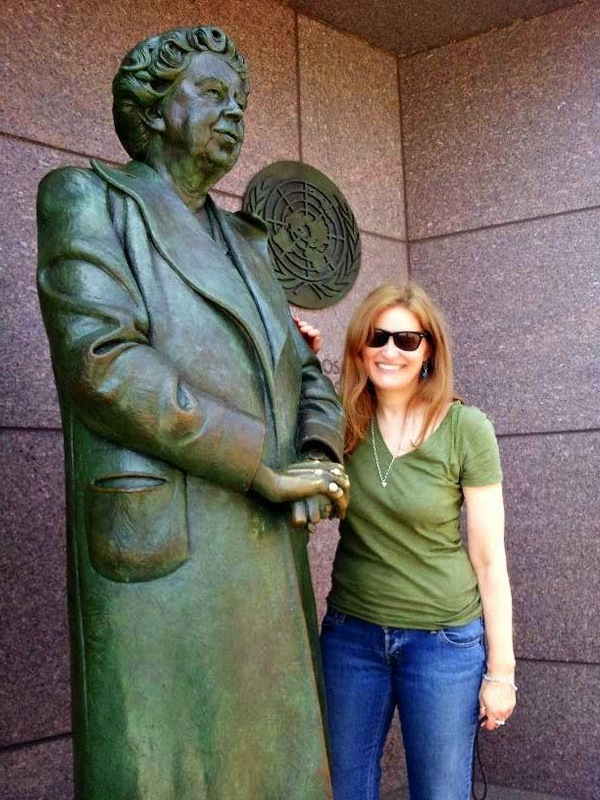 Here's Caroline Johns, Deloitte's top speechwriter, with the statue of Eleanor Roosevelt. The Willard Hotel: Martin Luther King, Jr. put the finishing touches on his "dream" speech in his suite at the Willard, which also is the hotel where the term "lobbying" is said to have been coined. Lincoln touched up his first inaugural address here, at a time when the Willard was one of the few tall buildings on this stretch of Pennsylvania Avenue. The National Press Club was born in the hotel's Round Robin bar. Much more on Willard history is here, and it's right around the corner from the White House. The Mayflower Hotel: Room 776 is where Franklin Delano Roosevelt wrote his first inaugural speech, which contained the line "the only thing we have to fear is fear itself." This is a few blocks north of the White House. The White House: The site of too many famous speeches to mention, not to mention the offices of speechwriters, which are not on the public tours. But many of the formal rooms on the tour have been the locations of remarks by the presidents. The Capitol building and rotunda: You can request guided tours of the Capitol through your Member of Congress or Senators if you are a U.S. citizen, or online for all. I like to call Washington "a small town with a lot of hot air," and since so much of it emanates from this building, that must be why there's a dome on top. If Congress is in session, you can see for yourself by getting tickets to the visitor's gallery. The rotunda includes statues of many famous American speakers. The National Building Museum: This is where Hillary Clinton gave her concession speech in the 2008 campaign for the U.S. presidency. Imagine this big open space filled on every level--it was an impressive setting. The Smithsonian National Portrait Gallery: This museum has a portrait of every U.S. president in one gallery, along with a video loop of FDR speeches. You'll also find portraits of many famous speakers in revolving exhibits. Lincoln and his family lived here during much of his presidency and it's where he worked on the Emancipation Proclamation. He used to commute to the White House on horseback, a journey described by poet Walt Whitman, who developed a nodding acquaintance with the president. 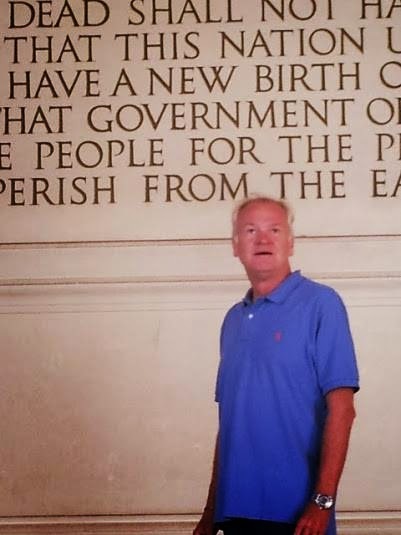 If you're a speechwriter inspired by Whitman's "Oh, Captain, my Captain," made famous again in the movie Dead Poets Society, it helps to know that the poem was his tribute to Lincoln after the president's assassination. Here are New Zealand speaker coaches Tony Burns and Olivia Mitchell with the great man and his horse. What a day for a speechwriter: meeting President Obama for exactly three seconds and @dontgetcaught for exactly three hours.